MIDDLETOWN— Middletown residents can dispose of unwanted medications properly and safely all year around and it’s right downtown Middletown. Mayor Joseph DeStefano made the announcement on May 20 that residents of the city and nearby communities can drop off expired medications at the police department lobby on James Street with no questions asked. 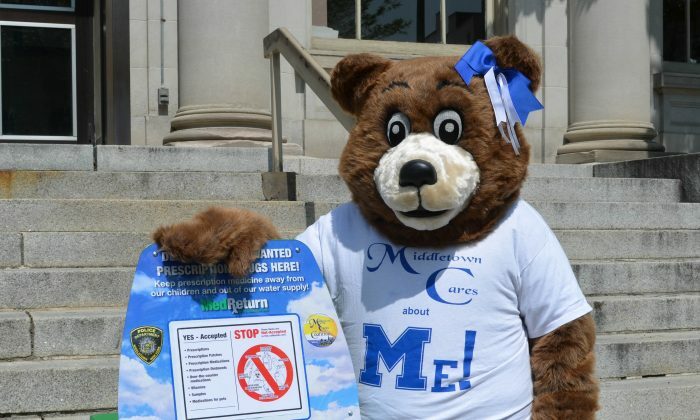 The Middletown Cares Coalition, an anti-drug organization in the city, and the Middletown Police Department have partnered to buy a prescription drug collection box, called MedReturn, that’s available 24 hours a day, seven days a week. DeStefano said the only drop off facility in the vicinity used to be the state police headquarters on Crystal Run Road. The drop-off is five miles outside of the city, which is difficult to get to for residents without a car. It’s everyone’s responsibility to properly dispose of excess drugs, DeStefano said. “More than 70 percent of young people abusing prescription pain relievers get them through friends or family, a statistic that includes raiding a family medicine cabinet,” he said. The mayor said he and his wife checked around their home the night before and found many they had to throw out. “It’s important that people realize the importance of taking care of them,” he said. Forgotten prescriptions in a family’s medicine cabinet can easily get in the wrong hands. In a 2014 national survey, 6.5 million Americans had abused drugs prescribed by their doctor. Forgotten prescriptions in a family’s medicine cabinet can easily get in the wrong hands and are often the first step to more serious addictions, said Lt. John Ewanciw, bureau commander of operations at the Middletown Police Department. “The cleaning out of our prescription drugs from our medicine cabinet, kitchen drawers, and bed tables will help to reduce accidental poisonings or overdoses, thefts, and use and misuse of these prescription medications,” he said. The National Institute of Drug Abuse says 80 percent of heroin users reported using prescription drugs before heroin in a 2013 study. The national Centers for Disease Control and Prevention reported the misuse of prescription medications, often found in the medicine cabinets of friends or family, accounted for 28,000 drug overdoses in 2014. DeStefano promised that the drop-off is anonymous. “When people drop off the prescriptions, there will be no questions asked, no names are taken. It’s completely confidential,” he said. The MedReturn box will be emptied as often as needed. Prescriptions, over-the-counter drugs, or expired medications in the MedReturn box will be burned at an incinerator in Dutchess County. DeStefano warned against other disposal methods, such as flushing unwanted drugs down the toilet or putting them in the garbage because they eventually end up in the city’s water system or landfills, which can lead to environmental problems. “Not only is it a health issue, it’s also an environmental health issue,” DeStefano said. When people drop off the prescriptions, there will be no questions asked, no names are taken. It’s completely confidential. Middletown Cares works through education, community outreach, and engaging stakeholders in their mission. The coalition supports the Summer Music Fest, the annual D.A.R.E. Day, Night Out Against Crime, and the 10K Classic Road Race. The coalition trained 35 bar and restaurant servers, owners of liquor stores, and check-out clerks in convenience stores to properly identify and intercede in underage drinking. A current project, Lock It or Drop It, encourages residents to lock up all medications at home and to properly dispose of any unused or expired medications. The drug collection box is produced by MedReturn LLC of Grafton, Wisconsin. The box is $695, a one-time cost. There is a small fee for disposal of the medication. “We will dispose of the prescription drugs at the same time we dispose of other collected drugs as they come into our possession through arrest,” Ewanciw said.